While slowing to pay a toll on the auto route, I spotted this couple a few cars ahead. I tried to hurry and catch up to them, but this man’s lead foot outdid even mine. It took me a good ten minutes at least to get close enough to snap this shot. 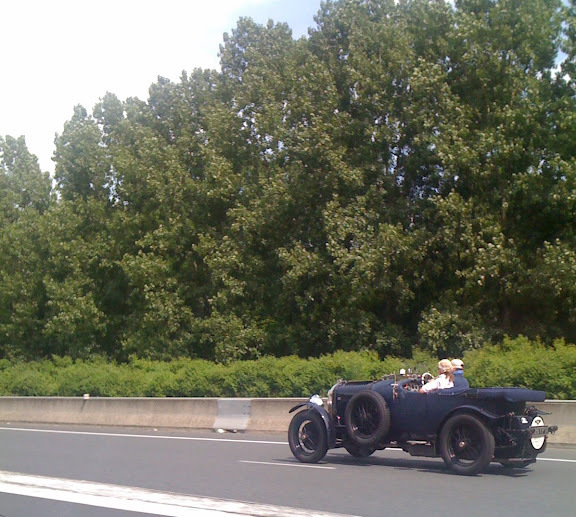 Not only is their car just about the coolest thing ever (a blue version of Chitty Chitty Bang Bang?) but the aviator caps, large sunglasses, and seemingly grab-life-by-the-reins attitude is also enviable. Apparently they ignored the memo that life wasn’t as fun or interesting after the gray hair set in. Good for them. May they be an inspiration to us all! Let's pretend we know about the couple; they were highschool sweethearts, and are still in love; now that the children are out of the house and they are retired, they go driving once a day in their beautiful automobil that he likes to wash and polish. Sounds like that one goes faster on land than Chitty Chitty Bang Bang! Do you think you can still start it with a crank in the front? How cool would that be?!? oh my, that is the chitty chitty bang bang...now i just need a toot sweet!